When patients suffer illnesses or injuries, Methodist physical and occupational therapists work to help them on the road to recovery. Sometimes in that recovery phase, patients need assistance from home medical equipment in order to return home. Unfortunately, home medical equipment can be pricey, and it isn’t always covered by insurance – if a patient has an insurance provider. So when it’s equipment needed temporarily as patients gain strength and heal, it’s a bill many simply can’t afford to pay. 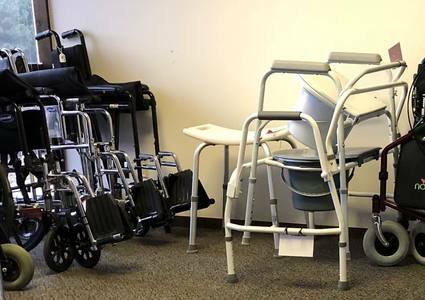 If unable to afford necessary medical equipment, many patients recovering from stroke, amputation, orthopedic surgeries, cancer or other illnesses are not able to discharge to home safely or be independent with caring for themselves. The Methodist Equipment Loan Program provides patients in need with access to free home medical equipment through a recycle-and-reuse program, enabling them to focus on recovery at home. 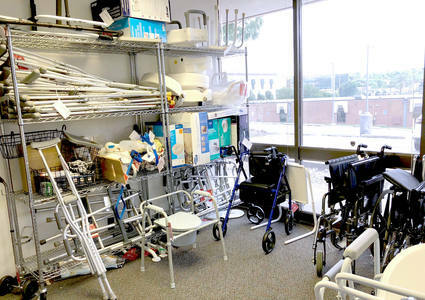 The program – run by Methodist staff and student volunteers – collects donated home medical equipment, ensures it’s cleaned per CDC standards and in good working order, and then loans the equipment free of charge to those who need it most. "Over the course of the last year, the program loaned out more than 77 pieces of equipment, saving patients more than $8,000." How is medical equipment loaned? Because the Methodist Equipment Loan Program is run by volunteers, it has no set hours. To reserve or pick up equipment, the patient or family member must call to inquire about availability and set up an appointment. Based on the patient’s need, the equipment can be borrowed for up to six months. While there is no cost to borrow the equipment, monetary donations are accepted to help offset the costs of maintaining the equipment and building the program. If you have home medical equipment in working condition that is no longer being used, consider donating it to the program. If you are able to donate medical equipment, you will be provided with a charitable donation receipt and you will be helping to improve the independence and safety of a patient in need. Donated funds are used to repair and sanitize used equipment and to purchase additional equipment to meet patient needs. If you would like to make a donation or are in need of home medical equipment, you can contact the Methodist Equipment Loan Program by calling (402) 807-3062. *Inventory may vary depending on availability. Hannah Wieger OTR/L, CLT, is a Staff Occupational Therapist in Acute Rehab at Methodist Hospital. She is also coordinator of the Methodist Equipment Loan Program, loaning home medical equipment to no cost to patients in need.